Josh Beaumont scored the only try as Sale inflicted a first home Premiership defeat of the season on Leicester. 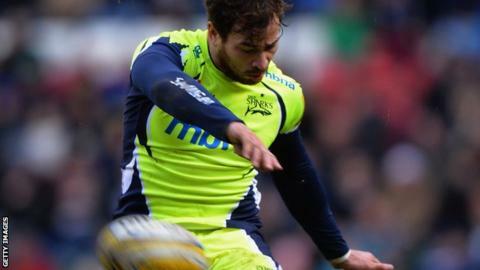 In difficult windy conditions at Welford Road, penalties from Danny Cipriani and Freddie Burns saw it all square at 3-3 at half-time. After Cipriani then missed five penalty kicks in a row, the Sharks went for a line-out and number eight Beaumont touched down from the driving maul. The Tigers rarely troubled Sale's defence in response. Leicester, who lost captain Tom Youngs just before kick-off after his return from a one-game suspension, having been left out of the England squad, had not been beaten at home in the league since London Irish did so in 2014. Sale, who continue their unbeaten start to 2016, have now won seven of their last eight games and move up to seventh. England forward Beaumont, captaining the Sharks for the first time in the Premiership, pressed his claims to be included in Eddie Jones' squad against Italy in the Six Nations next weekend. "It was a tough game. Sale played well in tough conditions and deserved it. "Physically they just about edged it and it turned when they brought the two props on. They were probably stronger than us there in that regard. "We are disappointed but we are still in third place. We will take a point and move on." "The only chance you have of winning here is when they are depleted by injuries and international call-ups. It was a tough fight but we just managed to get that score from a line-out and drive and we are delighted with the win. "We are a good side. We know we have a good record at home but if you are going to challenge for the top four you have to beat sides away and we did that today." "The wind was swirling all over the place so we had to stay patient. I thought Danny Cipriani controlled the game well and credit to him, he didn't get despondent with missing those kicks." Leicester: Bell; Betham, Tait (capt), Smith, Camacho; Burns, Harrison; Mulipola, Ghiraldini, Balmain, Barrow, Kitchener, Fitzgerald, McCaffrey, Crane. Replacements: Thacker, Brugnara, Bateman, de Chaves, Croft, Kitto, Loamanu, Roberts. Sale: Haley; Addison, James, Tuitupou, Edwards; Cipriani, Cusiter; Harrison, Taylor, Cobilas, Evans, Ostrikov, Neild, Ioane, Beaumont (capt). Replacements: Briggs, Lewis-Roberts, Mujati, Mills, Seymour, Stringer Ford, Arscott.